Taizo Yamamoto. Click for more. Japan. Photo by Peter Menzel. Click for more. China. Photo by Peter Menzel. Click for more. U.S.A. Photo by Peter Menzel. Click for more. By Glen Mullaly. Click for more. by Mark Richards; click for more. By Arman. Click for more. Via EverydayTrash. This is household trash, in a glass box, photographed by a French artist named Arman. More info here and here. Mildly related: Justin Gignac’s garbage in a box. Public Collectors says: “Scanned from The Plan by Michael Schmelling, 2009, J&L Books, Atlanta. ‘Between 2003 and 2005 Michael Schmelling photographed various homes and apartments in the company of Disaster Masters, a New York-based agency that specializes in cleaning homes and counseling hoarders.’” Via Dinosaurs and Robots. Disassembled household appliances photographed by Brittny Badger, via the invaluable Junk Culture. Can Opener; click for more. See also Adam Voorhees’ “Exploded” images, noted early on in this series of posts. I’d been meaning to mention that Lisa Congdon’s Collection A Day blog, mentioned earlier here, is still awesome. The perfect excuse: the below, via Swiss Miss. Day 107: Bread Bag Ties. Click for more. 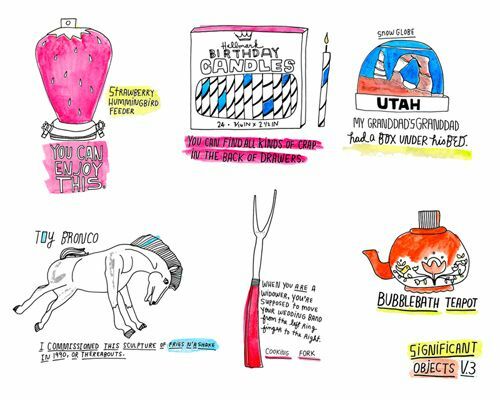 Signficant Objects X Kate Bingaman-Burt X 20×200 — now available! 11×14; edition of 500: $50! I teased this last week — and now it’s here! We’re really excited to announce the latest Significant Objects team-up, resulting in thoroughly affordable art, and another way to support v3 beneficiary Girls Write Now. The prints you see on this page are available in limited editions from 20×200, Jen Bekman’s online project that sells a dazzling array of prints from an impressive roster of artists, all priced to meet a mission of making art available to all. 16×20; edition of 20: $200! 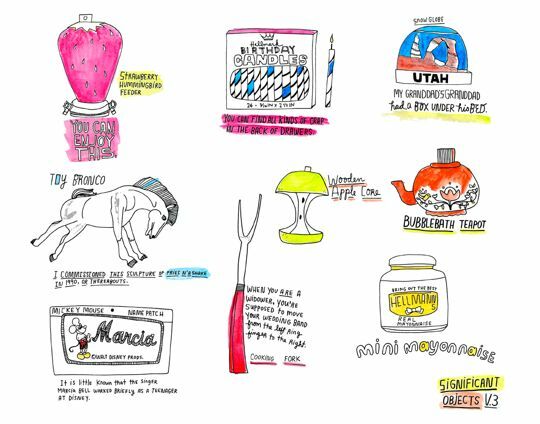 The artist is Kate Bingaman-Burt, whose delightful book Obsessive Consumption was just published, and whose combination of thoughtfulness about consumer behavior and mad drawing skills make her our perfect match. All these prints are created using archival pigment inks on 100% cotton rag paper with a matte finish. 8×10; edition of 200: $20! Proceeds from the sale of these prints will benefit Girls Write Now, contributing to Significant Object’s grand total donation. Girls Write Now provides guidance, support, and opportunities for New York City’s underserved or at-risk high school girls, enabling them to develop their creative, independent voices, explore careers in professional writing, and learn how to make healthy choices in school, career and life. 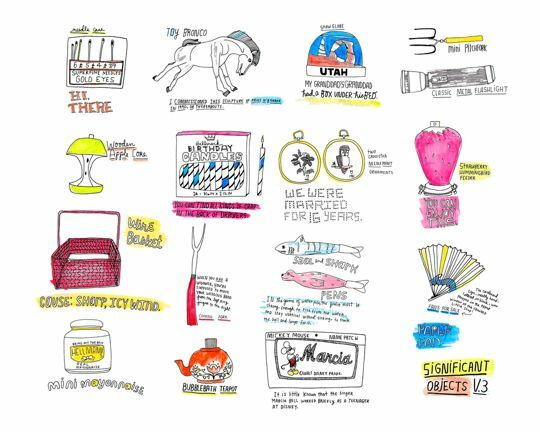 This post was written by Rob Walker on April 17, 2010	Comments Off on Signficant Objects X Kate Bingaman-Burt X 20×200 — now available! Helga Steppan / All My Stuff - White / Click for more. Helga Steppan / All My Stuff - Red / Click for more. By Chen Karlsson. Click for more. Thx: Gabriel. Seen also on Significant Objects. Part of an occasional series. Betty Parsons. Click for more. A Betty Parsons piece made from “carpenters’ throwaways.” Via Junk Culture. Part of an occasional series. Pictures of stuff, cont’d: Take-out lids, etc. A few images from a Flickr set by sarcoptiform, courtesy of Shawn Wolfe. Part of a series. This post was written by Rob Walker on April 11, 2010	Comments Off on Pictures of stuff, cont’d: Take-out lids, etc.